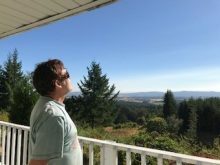 Today from my home in Oregon I experienced a total eclipse of the sun. For 2 minutes at around a quarter past ten this morning the moon’s orbit carried it to a position which caused the moon to block light from the sun from hitting Earth along a swath some 75 miles wide. 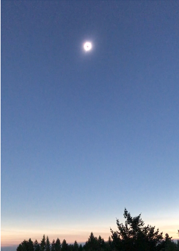 During the time of “totality” my land Reltonia took on the appearance of twilight and I was able to look up at the sky and see the corona of the sun projecting outward from the circumference of the moon. Even with my understanding of the dynamics of the movements of celestial bodies, I was awestruck by the sight. 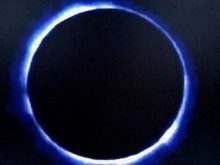 Since the eclipse occurred only in selected states of the United States, running southeasterly from Oregon, through the area (East St. Louis, Illinois) where I was born, and then exiting the nation of my birth, I realized that (except for the Bahamas, which probably experienced the eclipse too), this celestial event was NOT a worldwide event. Yet, the experience caused me to think of Earth even more than I usually do. She was treated to a peek-a-boo game, courtesy of her lone child the moon and her father the sun. As the temperature dropped quite rapidly in the few minutes during which my little patch of Earth was caught under the moon’s shadow, I felt a great sense of wonder as I thought of just how rare it must be even in a universe of millions of planets orbited by satellites to have any one satellite to match exactly the perceived size of the sun around which that satellite would exhibit to any inhabitants observing its covering up of its orbited planet’s sun from the surface of that planet. Such is the stuff of miracles! All the more reason to cherish — and save — Earth! !